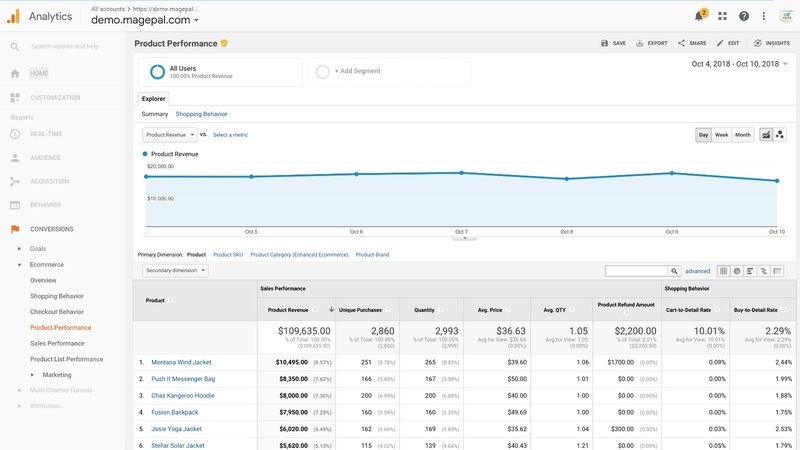 Enhanced E-Commerce is one of the most powerful reports in Google Analytics. 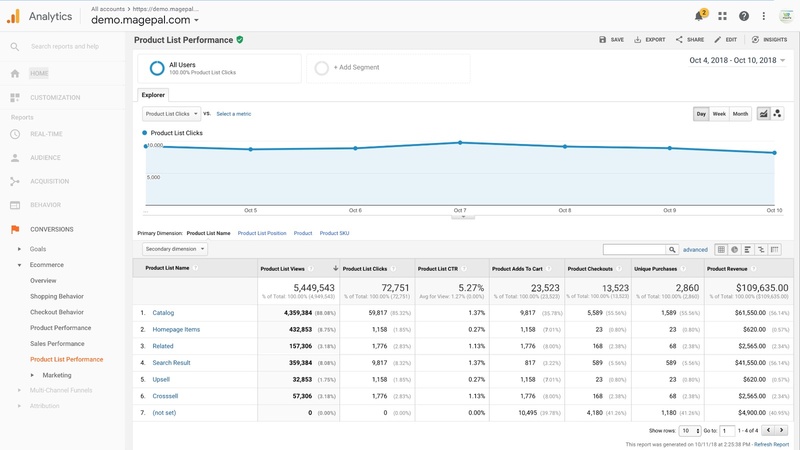 Enhanced Ecommerce provides many metrics and reports that standard Google Analytics do not provide; this includes product impressions, product detail views, add to cart actions, remove from cart actions, check out steps and purchases using Google Tag Manager Data Layer. With our Magento2 Extension, you can quickly and easily add Enhanced E-Commerce to your Magento store. 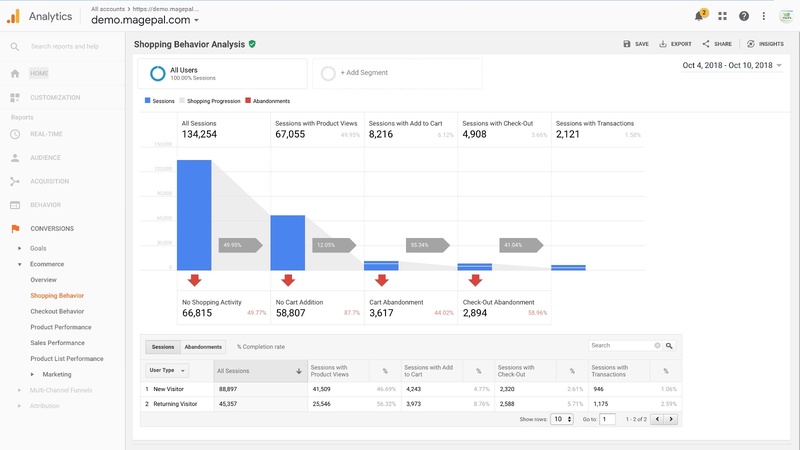 Get in-depth reports about your customers' shopping behavior, your product performance, and more with our Enhanced E-commerce for GTM. 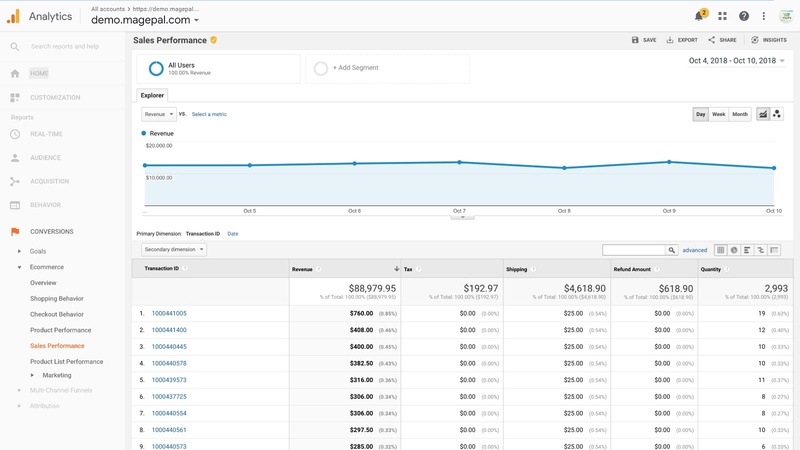 The Shopping Behavior Report provides detail conversion matrix on how your site visitors’ moves from one stage to the next of your sales funnel. This report displays the total number of sessions for a given date range and then displays statistics on the number and percentage of sessions with product views, sessions with add to cart action, sessions with checkout and finally the number of sessions with successful transactions. Why Is Shopping Behavior Important? This report is vital to all store owners' because it gives you a clear picture of how users are interacting with your products and also provide insight into where you are losing customers. This report can quickly identify and allow you to fixed issues such as a lot of products page viewed by your user but next to zero products added to their shopping cart, a lot of abundant cart because of user drop off at the shipping step or a lot of users adding products to their shopping cart but very few users enter the checkouts process. 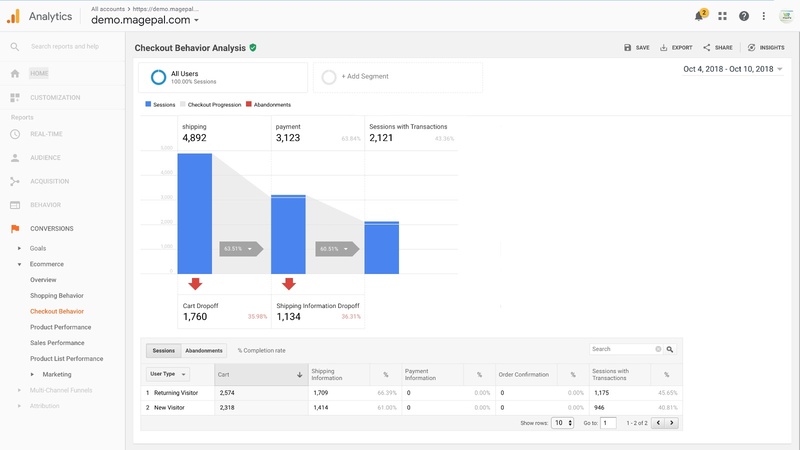 Like the Shopping Behavior Report, the Checkout Behavior Report shows the users interaction with each step of the checkout process. This includes the number of sessions who visit the first step of the checkout process and a breakdown for each step.